Friday’s fossil featured fabulous fancy flanges—weird processes at the rib-ends that look like overlapping rubber spatulas. What the heck are they for, and to whom do they belong? The latter is easier to answer: Eryops megacephalus. Eryops is a vertebrate palentology rock star. Everyone loves Eryops. I mean, look at it! It’s so cool! It’s among the largest known amphibians, growing to be as long as adult humans (1.5–2 m). Their species name, megacephalus, means “big head,” and these guys did have big heads—their head length accounted for about one-third of their overall length. Seriously big heads meant seriously big jaws with a seriously wide gape. Housed inside the jaws were lots of seriously scary teeth, as you can see in the photo. Additionally, three rows of backwards-facing teeth projected from the roof of the mouth, presumably to prevent dinner (in the form of fish and other sea life) from escaping once caught. This is important because Eryops couldn’t really chew. Instead, it would have used thrusting movements of its head to push prey back toward the throat. Snakes, another group of non-chewers, also have palatal teeth to keep live prey from escaping. It might not make for good table manners, but it’s certainly effective. 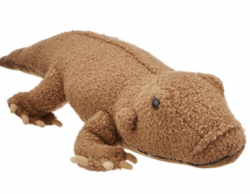 I wasn't wild about any of the reconstructions available royalty-free, so I bring you this stuffed Eryops toy--available on Amazon! How do I not have one already? 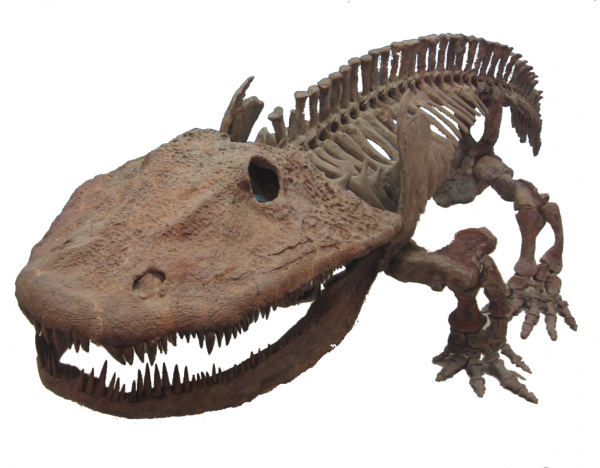 Features of Eryops’s skeleton suggest that it lived in a semi-aquatic environment, not unlike that of an alligator or crocodile, animals to which it’s often compared. The arrangement of the shoulder and hips indicate a sprawling posture, which probably made movements on land a bit awkward and laborious. Its movements in water might not have been that much more graceful, either, as its tail was stiff and its snout short. But clearly these impediments didn’t hold Eryops back. After all, if you’re one of the biggest things around—as Eryops was—you don’t really need to be all that crafty or agile. Fossils of E. megacephalus, the only known species of the Eryops genus, have been found in the Permian of Texas and the later Carboniferous of New Mexico. This particular one is from the Lower Permian (295 million years ago or so) in Texas. Giant anteaters have broad, flat ribs that overlap in places. (WereSpielChequers via Wikimedia Commons) So, now for those ribs. What gives? As I’ve argued before on this blog, asking “what’s that for?” is not always appropriate—not everything is adaptive, and often features get co-opted along the way for new purposes. These weird overlapping rib things, though, seem likely to be “for” something because a similar feature shows up in other groups of animals, including my all-time favorites, the xenarthrans. My late advisor, Farish Jenkins, argued in a 1970 paper that wide, even overlapping, ribs help to strengthen an animal’s trunk by causing the ribs to lock against each other when the spine started to twist. Off the top of his head, my paleontologist friend Corwin Sullivan mused, “I suppose it saves some muscular effort when walking, and makes the body easier to support—especially when you're a large, awkward, lurching creature like Eryops.” It sounds plausible…does anyone want to test it? While we wait for that dissertation to be written, congratulations are in order to Dan Phelps!